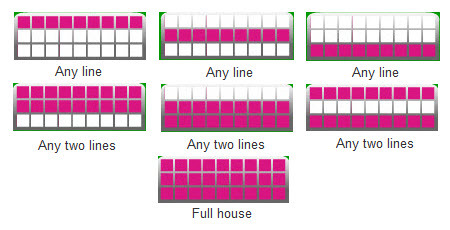 The tickets sold at 90-ball Bingo games consist of a 3X9 chart of numbers. Each line of 9 boxes displays 5 numbers and 4 empty spots. After you purchase tickets for a bingo game, the next step is to wait for the game to begin. You can keep track of the time left until the game starts by checking the "Game Starts" countdown., which appears in the top left corner of the bingo screen. To read more about our progressive jackpots, please click here.